The 'Brexit' referendum vote, split 52% to 48% in favour of leaving the European Union, has been exploited by the 'mainstream' media to launch yet another assault on Labour leader Jeremy Corbyn. 'Impartial' BBC News, directed by former Murdoch editor James Harding, has been one of the worst culprits. The BBC later added balancing comments, after receiving complaints. The following morning, BBC News misinformed the public that Tom Watson, deputy leader of the Labour Party, had told Corbyn that he must resign. This was false. BBC News quietly retracted the claim without admitting their error. Indeed, as captured by a Labour activist, BBC News had three significantly different headlines in just twenty minutes. It looked as though the BBC's desire to be rid of Corbyn had raced ahead of the facts. 'Allies of the Labour leader said the confrontation at Pride had been staged by anti-Corbyn activists who were attempting to undermine the leader's position'. '1) why does it not make clear that Mauchline is a PR man for Portland Comms? As far as we can see, the Guardian's political editor simply ignored the awkward questions. Meanwhile, BBC News ran a live feed on their home page with the headline, 'Corbyn crisis and Brexit'. Brexit was almost an afterthought; it certainly seemed to be playing second fiddle to the 'Corbyn crisis'. Anyone seeing this could be forgiven for asking about the BBC News editorial agenda and its setting of priorities. It was as though we were to forget that Prime Minister David Cameron had announced his resignation three days earlier; and that Cameron and the Tory party had led the country into a referendum that had resulted in the FTSE 100 index falling more than 8%, and the pound falling against the dollar by 10%; and that a number of Tories were scrambling to become the new leader, including the warmongering, climate-denying Boris Johnson. But, true to form, BBC News was happy to hammer on about the 'Corbyn crisis'; this despite the fact that 'Labour persuaded two-thirds of its supporters to vote remain'. It was actually surreal to read a post-Brexit BBC article on June 28, 'Conservative leader: Who might succeed David Cameron? ', reminding readers of Johnson's 'unique brand of charisma making him a household name... he is regarded as being an electoral asset', while Michael Gove was 'reforming, if controversial' and 'is still respected on both the Remain and Leave wings of the party'. No serious criticism of either politician was included, despite their deep responsibility for the Brexit crisis. By contrast, as we saw above, the BBC was only too happy to include damning judgements of Corbyn. Perhaps the worst example of an anti-Corbyn attack, post-Brexit, was in the Mail on Sunday. 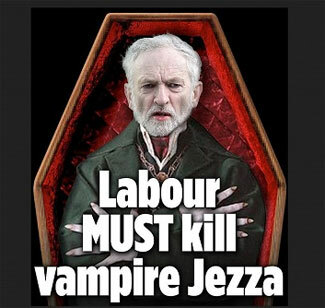 A piece by Dan Hodges was illustrated by a Photoshopped image of a malevolent vampiric Corbyn in a coffin with the despicable headline, 'Labour MUST kill vampire Jezza'. That this should appear just ten days after Labour MP Jo Cox was brutally murdered is almost beyond belief. It is true that sub-editors write newspaper headlines. But Hodges could still have indicated that he recognised the callousness and irresponsibility of the headline and photo. This explains why the corporate media have avoided mentioning that Corbyn won last year's leadership election by a 'landslide', winning 60% of the vote, more than all the rest of the candidates combined. Despite noting that Angela Eagle is the likely leadership contender, the media have also ignored a February YouGov poll that found that 60% of Labour members would vote for Corbyn in a new leadership race, with 15% supporting Hilary Benn and just 6% supporting Angela Eagle. The independent journalist Steve Topple highlights the links between coordinated attacks on Corbyn and a network of Labour figures with direct links to the PR company, Portland Communications (mentioned above). The PR firm was set up in 2001 by a former adviser to Blair. Its clients include the World Economic Forum, the EU, the UK government, Barclays Bank and large companies, including Morrisons and Nestle. 'Labour rebels hope to topple Jeremy Corbyn in 24-hour blitz after EU referendum'. This is all part of a bigger picture of how the BBC has put 'its full weight behind the Corbyn coup', as Carlyn Harvey notes. Readers may recall that Kuenssberg helped to orchestrate the on-air resignation of a shadow Labour minister earlier this year: another attempt to undermine Corbyn's leadership. The 'Guardian view' is that the 'Corbyn experiment is effectively over at Westminster'. This casual dismissal comes from the 'liberal' paper which opposed Corbyn from the start, and which makes no mention of the relentless media wrecking campaign against him, including its own ugly role. The 'Corbyn experiment' is an experiment in real democracy; something which the Guardian has sought to destroy. A responsible newspaper would relentlessly expose the truth about society; namely, that 'politics is the shadow cast on society by big business', as the American philosopher John Dewey said. Nobody should be surprised at the shameful performance of the corporate media, especially BBC News. Any threat to the 'natural order' of power brings the schism between private interests and public interests into sharp focus. The heightened, almost farcical, attacks on Corbyn are thus entirely predictable. Rather than feeling anguished at this state of affairs, we can regard it as a sign of how nervous and vulnerable the establishment is when an awakened public challenges elite power. In our original alert we wrote that 'Attempts to unseat Corbyn have been supported by Left Foot Forward Ltd'. We haven't been able to substantiate this assertion and so have withdrawn it.